It is winter. Winter means I am not golfing anymore and I have more time to use sourdough. I decided to try something new, Sourdough Buckwheat Pancakes. I really like buckwheat in my pancakes, just enough to give it some texture and rich taste. 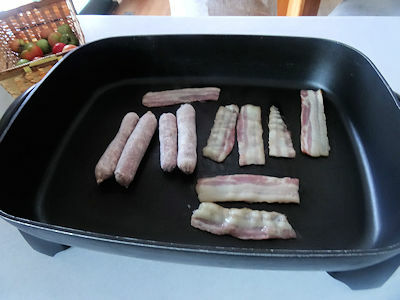 I started by cooking some home made sausage and bacon. You just can’t have good pancakes without them! I added sourdough starter, sugar, egg, buckwheat,milk, oil, and salt to a large mixing bowl and stirred them together. I got the skillet up to temperature (400 F) and then mixed the soda and water. I gently folded that mixture into the batter. I put about 1/3 cup of the batter on the grill for each pancake. We like blueberries on our pancakes so I sprinkled a few on the batter. When the pancakes are covered with bubbles and starting to set around the edges, flip the pancake and cook to golden on the other side. 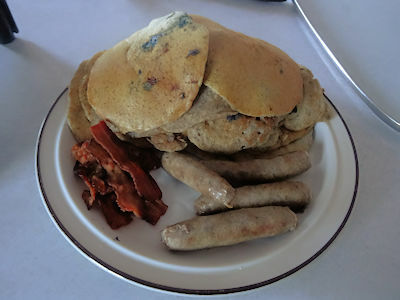 The buckwheat really improves these pancakes. The touch of sour and full flavour of the buckwheat really go together well. By using just a little buckwheat, they are still tender and light. Mix sourdough starter, sugar, buckwheat, egg, oil, milk and salt in a large mixing bowl. Preheat a non stick skillet to 400 F.
Mix baking soda and water together. Gently fold the soda mixture into the batter. Immediately start cooking the pancakes. Drop 1/3 cup of batter onto the skillet. If using blueberries, sprinkle a few on top of batter. When the pancakes are covered with bubbles and the edges are setting, turn the pancakes. Cook until the second side is golden. You can keep the pancakes warm in a 200 F oven until all are cooked.